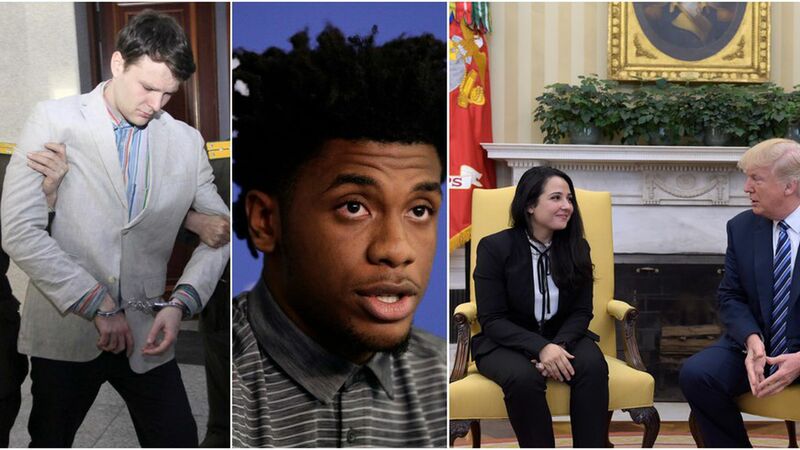 While in China for his overseas trip, President Trump pressed Chinese President Xi Jinping to release three UCLA basketball players who had been put under arrest for stealing designer sunglasses the week before. This makes five Americans Trump has worked to successfully return home after being held in foreign prisons. Our thought bubble: Trump prides himself on being a dealmaker, and helping negotiate Americans' return from foreign nations has been a prominent success for which he can claim credit. The back story: During Obama's presidency, Trump often called on the administration to find ways to free Americans being held overseas. He was particularly critical that the Iran deal did not include the safe return of several American hostages. 3 UCLA basketball players were arrested two weeks ago in Hangzhou, China, for shoplifting. Trump, during a visit to China the next week, asked Xi to release them. Trump then tweeted asking whether the basketball players would thank him for ensuring their release, and in a press conference they did. Aya Hijazi, an Egyptian- American charity worker, returned to the U.S. in April after being held in Cairo for three years. President Obama had been unable to secure her return, but Trump reportedly managed to reach an agreement with Egyptian President Abdel Fattah al-Sisi. Otto Warmbier: The UVA student who had been sentenced to 15 years of hard labor in North Korea for stealing a propaganda poster while in the country for a study abroad program. He was returned to the U.S. in a coma a year later after the Trump administration managed to reach an agreement with the North Korean government. Warmbier died several days after his return. These are the prisoners being held overseas who Trump and his administration have been making efforts to bring back to the U.S.
Leopoldo Lopez: He's a Venezuelan politician and activist who was put in jail in 2014 and transferred to house arrest in 2017. Trump tweeted about him in February, and in August, the White House said in a statement that it would hold Venezuelan President Nicolas Maduro "personally responsible for the health and safety of Mr. Lopez." Robert Levinson was an FBI agent who went missing in Iran 10 years ago. In 2015, then-candidate Trump swore to bring Levinson home, along with the three other Americans held hostage in Iran, if elected. This March, then-press secretary Sean Spicer said, "We want him back, and we will spare no effort to achieve that goal," according to the Washington Post. Siamak and Baquer Namazi: In June, the Washington Post reported that the White House was ramping up efforts to return the businessman and his father home after being placed into custody in Iran in 2015. Xiyue Wang is a Chinese-born American who has been sentenced to 10 years in prison in Iran for spying. In a White House statement released in July, Trump placed responsibility for Wang's health and well-being on Iran. Andrew Brunson: Last year, the pastor was taken into custody in Turkey and the Trump administration has said it is a priority to get him home. Austin Tice: The Trump administration set up a backchannel to try and secure the release of the journalist, who is being held hostage in Syria.